I adore the way that Byrd Baylor and Peter Parnall have collaborated over three decades to create beautiful and poignant stories for children and adults alike. These are simple tales in form and layout, yet profoundly complex when read again and with fresh eyes - there is magic hidden in them. I have used these stories in my classrooms as introductions to larger concepts, and also just for the space and breath they provide. Each of these fables is a meditation on old ways of knowing, some prehistoric and some as old as the Earth itself. How do we truly and deeply connect children to their world? In the push for digital literacy we cannot forget and forgo the importance of children feeling the world around them. It is not enough to show; we must provide experiences for them to do: to touch, to smell, to listen, to taste, to be still and to know. 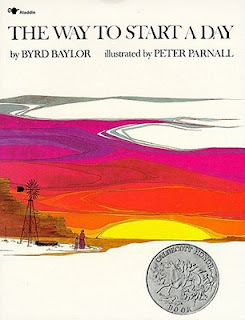 In The Way to Start a Day, Baylor and Parnall remind us of the simple ritual of greeting the Sun each morning. When we intentionally share our interest in these cosmic rhythms, we demonstrate its value to our children. Taken further, we can overtly connect our practices to the rituals of our ancestors, and to people across the globe and through time. These connections are like the colors on the palette held by a painter, each color a new way to represent the detail of the subject being painted. When we root our modern lives in the natural patterns around us, and connect to the rituals held by cultures around the world, we add to the richness of what it means to be human. Happy New Year! Looking forward to this next voyage around the Sun.